Turkmenistan is a Muslim country, and the Turkmen were the first in the region who converted to Islam. However, faith has clear national differences here. Tribal relationships having formed during the centuries, in Turkmenistan have less importance than religious dogma. Even urban residents clearly distinguish members of their tribal group in remote areas the clan and tribal attachment is simply dominant. Each tribal group easily distinguishes the dialect, style of clothing and jewelry, embroidery and even texture and style of carpets of their group, and is well versed in the features of other tribes. 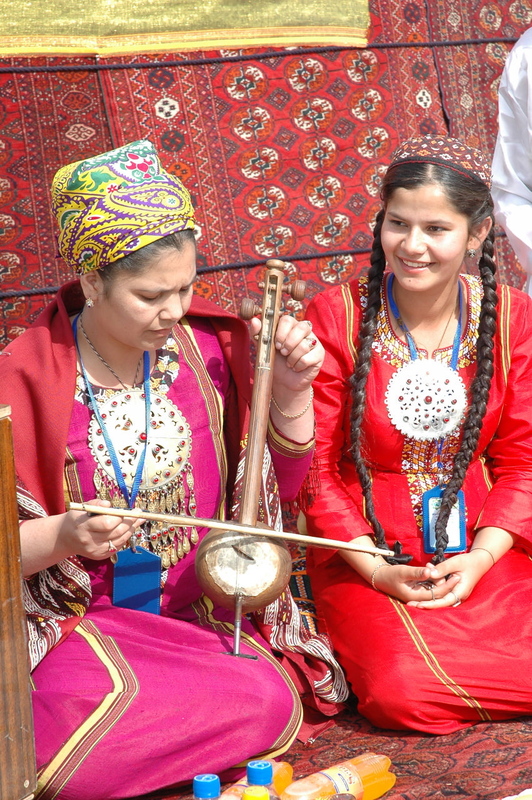 Of all Central Asian countries and peoples, the Turkmen, perhaps, more committed to their traditional clothing. Until now, many residents of the country with evident pleasure put on hairy papakhas and long quilted dressing gowns and similar to trousers slacks. Women often wear long silk dresses and striped trousers, hiding hair under scarves and headscarves. And the matter is not in the ethnic differences - such clothing is just convenient in hot and dry local climate. And ornaments are amulets. A large number of customs and traditions accompany the whole life of local residents and family mode. 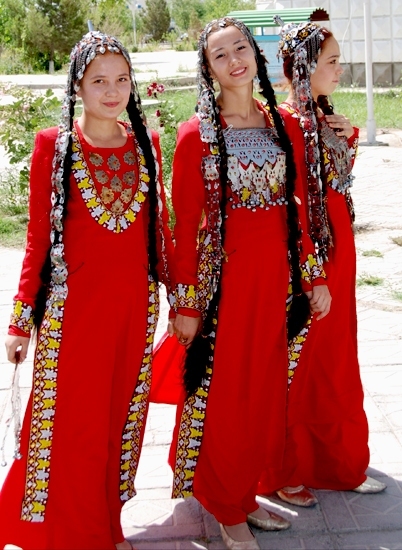 For example, the celebration of marriage - one of the most important events in the life of the Turkmen, and not only the bride and groom, and the whole community. In rural areas, where one can see many old traditions that came into the local way of life since nomadic times, special representatives of the families take all preliminary preparations of weddings on themselves. Bride wealth - another important part of the ceremony. Depending on the region and wealth the volume of the buyout is different, but the family of the bride may require truly enormous bride - wealth from the groom. And the wedding itself is a real feast for the whole community. It may take several days and usually expected for several hundred of guests. 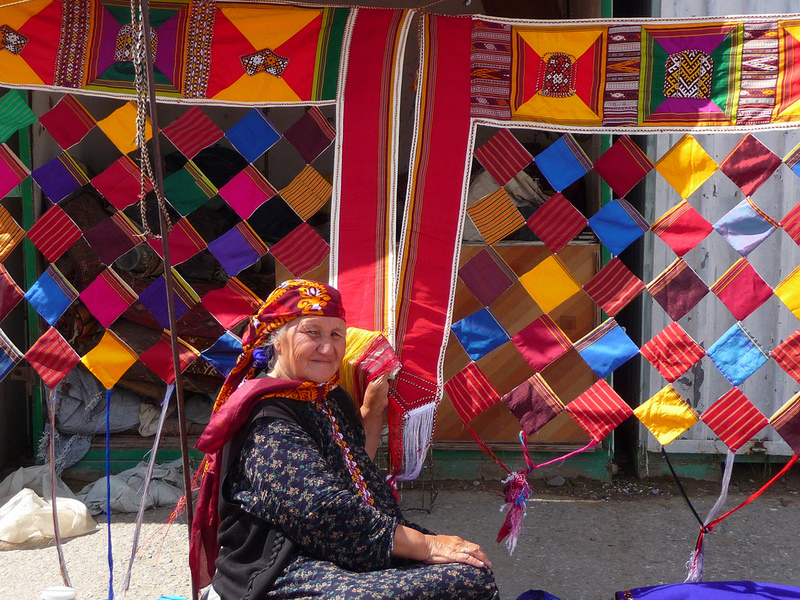 Carpet weaving - one of the oldest traditions of the country and the symbol of the Turkmen people. For the nomadic Turkman the carpet has always been the only piece of furniture - easily transportable and warm carpets served to cover the external edgings of yurts "kara-oy", decking for the floor and bed. At the same time, their elegant and sophisticated design, each ethnic group has its own design, has been a business card of the family, and home decoration. The art of carpet weaving is very complex and time-consuming, traditionally handed down from generation to generation, and the ability to weave beautiful carpets has been considered as one of the main benefactors of the brides and wives. In Turkmenistan, the carpet has been sacred, even the flag of the country shows the carpet motives. That is why nobody is surprised that a real carpet is a work of art and very expensive. The same attention is paid to jewelry. These are numerous women jewelry, serving as expression of traditions and a sign of social status, and subjects for men, which for many centuries have been the main form of saving - a bag with the treasury in nomadic way of life will be more likely, a burden. And the decorations have a sign status, pointing to the age, marital and tribal status, social status and wealth of their owners. The works of the Turkmen masters of the past in a variety reached our days and they are family relics, carefully passed down from generation to generation. Modern jewelers are no less skillful. And often not only luxuries, but also weapons, clothing, harness, household items and worship, as well as carpets and various utensils are artistically decorated. Turkmen themselves are quite friendly and affable. During the years of independence, the flow of tourists into the country has fallen, and today the meeting with a foreigner for many of them is infrequent. And taking into consideration the well-known cosmopolitan of local inhabitants, this factor is important for them - many Turkmen with nostalgia remember Soviet times and are very glad to "the guests" from the north "and not only to them. And, curiously enough, often these quite understandable emotions at first contact are hidden under the mask "I do not understand you", but it quickly "disappears" with keen interest to life and modest of owners. But taking into account the peculiarities of the local hospitality, which is ranked by the travelers with the hospitality of the Caucasians, communication with the Turkmen often turns into a pleasant event for both sides. 12th of December - Neutrality Day. Islamic holidays (Kurban – Bayram, Bayram Ramadan and others) are counted according to Muslim calendar, that is why the dates are approximate. Some holidays may start according to the decrees of Turkmenbasha, that is why their dates may vary.